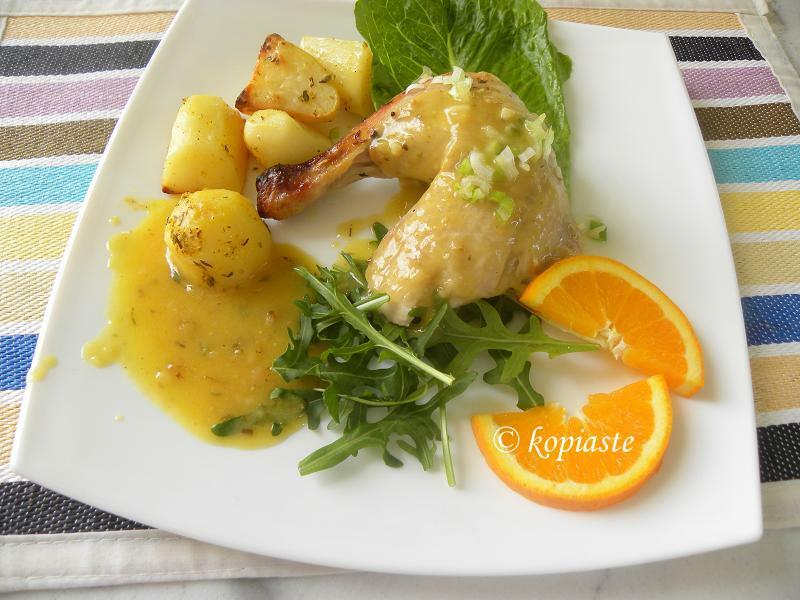 Kotopoulo Portokalato is a chicken recipe of mine which is very easy to make, as the only thing needed is to marinate the chicken in a roasting bag with orange juice and other ingredients and then bake it with potatoes. You forget it in the oven until it is done without having to watch over it or turn it over. After the overdose of butter and sugar during the Christmas period, you might want to eat something light, delicious and healthy for a change. I know that I do and although personally I shall start eating healthier, I still need to post some of the recipes I have made during the holidays. On New Year’s Day I posted a list with recipes I made during 2010 and did not manage to post them and believe me there are many more I have not mentioned. If you want to see any of these recipes posted, just leave me a message and I shall try and post them the soonest. I am starting this list with Kotopoulo Portokalato, which is a paraphrase to Kotopoulo Lemonato, a classic Greek recipe with chicken and lemon, which was a request from one of the readers of my Greek blog. The Chicken with oranges was cooked last March when my son visited our relatives in Sparta. They have orange groves and whenever we visit they fill the trunk with lots of bags of whatever they produce. See my post back then. We ate as many as we could but also used them in a lot of recipes, most of which have not been posted yet. This recipe is so easy to make (did I mention how healthy and delicious it is? ), all you have to do is marinate the chicken in an oven bag and then bake it in the oven. Mix in the orange juice all the marinade ingredients. Wash the chicken and put it in the baking bag together with the marinade ingredients and marinate for 1 – 2 hours. After the marinating time, peel and wash the potatoes and if you are using big ones, cut them into smaller pieces. Season with salt, pepper and oregano and wet them with the olive oil. Add the potatoes in the bag and seal them with the wire provided with the bags. Place the bag in a baking dish and make a couple of slits on the top side of the bag so that steam may escape but prevent the juices from coming out. Preheat oven at 200oC/395oF and bake the chicken and potatoes for about 1 hour or according to directions on roasting bags. After roasting the chicken, cut a hole in one corner of the bag and remove all the juices in a bowl. In a non-stick frying pan heat the olive oil on medium heat and sauté the spring onions until translucent. Add the flour and mix to make the roux. Add the wine, mix then add the juices and stir until it begins to thicken. Taste and adjust with salt and pepper and finally add the milk and mix again for a few minutes. I am linking this recipe to Antonella’s blog, who will be featuring it in Mediterranea, representing Greece. My special thanks go to Antonella, for selecting my blog but also for placing a picture and a link to her blog for my cookbook without even asking her to do this. Antonella is automatically in a draw. To show my appreciation to all of you who will follow Antonella’s footsteps by helping me promote my cookbook, I am offering a copy of my cookbook. All you have to do is right click on the image of the book below and “save as” on your computer. Then upload it to your side bar with a link to my blog or directly to my e-store and leave me a message at this post with your URL. As I cannot offer a copy to each one of you individually, I want to thank you in advance for your kindness and at the end of this month, one of you will be the winner by a random.org selection. I am also linking it to Heni, of Simplicity’s Table by the Sea, for her event of January, Food of the Sun: Healthy for 2011. Mmmmhhh, so flavorful! That combination is mouthwatering and delightful. I will add the link. Hello Ivy. I didn't pass by for a very long time. I was very busy. I am happy that you published your book. It is my pleasure to place a link to it on my blog. Have a nice day and a better year. Πολύ ωραίο το κοτόπουλο σου!!! ΄Εβαλα στη σελίδα μου το βιβλίο σου. Efharisto Xanthi. Epomeni syntagi loipon tha einai to agrigourono. Thank you Xanthi. Next recipe on my blog will be the wild boar. Ivy, this looks light and flavoursome! That recipe looks yummy. I will have to make it. I always have oranges in my house. healthy,delicious way for a chicken,love the sauce! Thank you Simona. Simona told me on Facebook that she added the book on her sidebar so Simona is also in the list. What a mouth watering photo of a super tasting dish. I love citrus with chicken. This will be a fun recipe to try. I would like to win your cookbook and will add the link. Good recipes. Belinda, you have not left the URL of your blog, so please let me know again. Thank you. Une recette sucrée/salée des plus délicieuses. C'est avec un énorme plaisir que j'ai mis ton livre sur ma barre latérale. I love Greek food and would love to win a copy of your cookbook. I’ve pasted the image and link on my blog, http://www.judyskitchen.blogspot.com/. The only time I eat chicken is when I'm in Greece. The chicken tastes real there and you can even tell by your photos the parts aren't massive like they are in the states (from all the hormones). Love the orange flavors too. With our oranges at their peak right now, this is the perfect dish for us!! Hi Ivy, I fixed the link and it is working now. http://judyskitchen.blogspot.com. A great twist on the usual lemonato Ivy! I must try it! Ha, ha, never thought of that but you are right 🙂 Thank you very much Eleni. Hope you will enjoy all the recipes!! congrats on your book – I saw it on Alison's blog (from Romania) – I think it's wonderful what you are doing! Thank you Zazuza, nice to meet you. Very tasty the portokalato chicken. I am overdozed of everything after this Christmas. To detox I will have to eat salads and soups for a month. Filakia! Lovely blog! I like it very much! Congrats in you book! I posted it to my sidebar. Glad to meet you Daiana. Thank you very much. Nice appealing dish Ivy! Bookmarked it: good luck for the contest also! This looks great Ivy! I like oranges with poultry – I made marmalade chicken once. Chicken and orange marinade sounds like an interesting combination. And the plate looks very nice! The chicken must be super flavorful with this marinade, and I like the sauce too, an excellent meal! I love the sound of this orange chicken Ivy! And the sauce sounds like something special. I will stop back tomorrow and add a link as I am not on my usual computer right now. The marinade with orange sounds great with chicken. And, the sauce sounds fantastic too. A great chicken dish! The orange flavor sounds delicious. A great way to prepare chicken! This looks absolutely delicious! I haven’t had a good Kotopoulo Portokalato since childhood. My greek grandmother used to add a little smoked pimentón to her's for a little extra kick. Thanks for sharing this tasty treat!! Ivy Check my post. I have also linked the cookbook. I love the ingredients you splurged with that marinade…yum. I have a few recipes that I'll be trying out during the winter months…and yours is now part of that list. Here's wishing you the very best with I'm sure a well creatively dedicated cookbook. Thank you Claudia. Don't worry about not linking the book. I totally understand what you mean. Looks very tasty. The combination of orange and chicken is fantastic! I have added the cookbook to my new site. Ben, thank you. Seems I missed your comment but you are now in the list. Hi Ivy! I mentioned your cookbook giveaway in my blog post today. Any book with such a beautiful cover and a title that includes blossom water is a winner for me. Glad to meet you Bria and thank you very much for the mention. My greek grandmother used to add a little smoked pimentón to her’s for a little extra kick. Glad to meet you Daiana. If your relatives are from Sparta that must mean you are a Maniots, a very proud group of folks. My family traditionally makes a dish very much like this one. Does your book have recipes that are traditionally from this region or just Greece in general? Actually the Maniots are a little bit further away. Those from Sparta are called Spartans but Spartans and Maniots are both Laconians. My cookbook is only with Greek / Cypriot recipes. Thank you. Just skip the wine and add a little bit more broth.